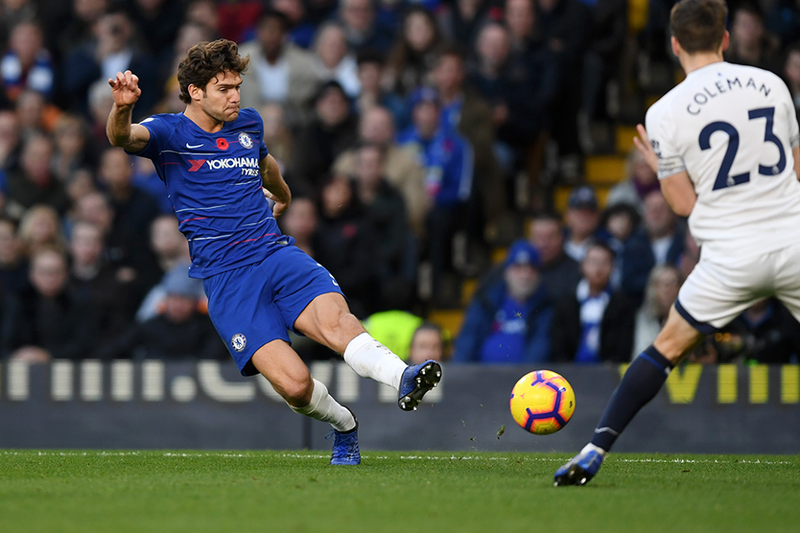 Marcos Alonso (£7.0m) extended his outstanding start to the Fantasy Premier League season in Gameweek 12. The Chelsea left-back is now the top points-scoring player in FPL after his eight-point haul in Sunday's goalless home draw against Everton. Alonso has overtaken team-mate Eden Hazard (£11.3m) at the summit by 86 points to 82. At a cost of £7.0m, Alonso is the most expensive defender in FPL but his ability to combine clean sheets with attacking returns makes him a major bargain. Indeed, in terms of points-per-million value in FPL, Alonso's 12.3 is more than any other player. The Chelsea defender has been one of the most consistent sources of returns this season. He has one goal, seven assists and six clean sheets in his 12 appearances. And his statistics back up his improved fortunes in Fantasy under new head coach Maurizio Sarri. Alonso's 18 shots on goal are more than any other defender. He is the leading player overall for bonus points, with his total of 14 only one fewer than he managed in 2017/18. The Spaniard has also been far more creative this term. Alonso's seven assists equals his combined totals from the previous two seasons. That rise in all-round potential looks very promising for Alonso. Should he maintain his current form, the Chelsea left-back can be one of the bargains of the season and offer a big challenge at the top of the player standings.